Creamy, coconut-infused cauliflower rice gets topped with crispy baked tofu, steamed broccoli, grated carrot and creamy coconut peanut sauce in this healthy and delicious buddha bowl. To make the cauliflower rice, add the riced cauliflower to a pan and stir in 1 cup of light coconut milk, 2 tsp garlic powder, the unsweetened coconut. Cook over medium to high heat for 5-10 minutes until tender and fragrant. Stir in the chopped cilantro. To make the peanut sauce, add all the ingredients to a container and use an immersion blender to combine, or add everything to a blender or food processor and mix until smooth. 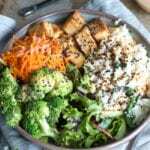 To assemble the Buddha Bowls, add a few scoops of cauliflower rice to a bowl and top with steamed broccoli, grated carrot, baked tofu, a handful of greens and plenty of peanut sauce. Sprinkle with sesame seeds and dig in! To make baked tofu, cube a block of firm or extra-firm tofu and place in a bowl. Add a few dashes of soy sauce, a generous amount of garlic powder and black pepper and toss to coat. Place the cubes on a non-stick or silicone baking mat-lined baking sheet and bake at 400 degrees for 35-40 minutes, flipping once half-way through, until browned and crispy. Follow this recipe for further instructions. This is a rough recipe. There will be lots of cauliflower rice so depending on how many people you are serving, there will be extra. You can use it in other recipes, enjoy as is, to replace rice in any dish or to make more bowls over a couple of days. The sauce recipe makes enough for 4 bowls.